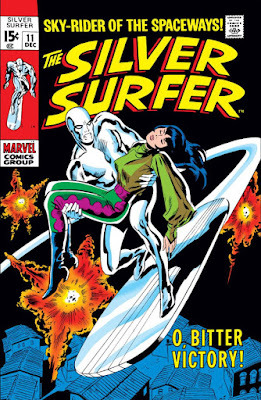 As frequently as Shalla Bal, the beloved of the tragic Silver Surfer, finds herself traveling to Earth to be used as a pawn in some scheme against the sky-rider, she should consider investing in a time-share--except that her visits invariably end with her being sent back to her planet, Zenn-La, leaving the Surfer a heartsick wreck at the unfairness of it all. But in a two-part Silver Surfer story from late 1969, it's Shalla Bal who takes the initiative this time in making the journey to Earth--while the Surfer struggles to understand the driving force behind the savage and hostile behavior of the humans with whom he must share this world. "Cogito Ergo Sum" Cries... Primus! With so many of artist Jack Kirby's character creations from his brief return to Marvel during 1976-78 having gone on to find new life in stories following his departure, it's a delight to see them turn up where you least expect them, as other writers continue to dip into that pool and recycle his concepts into new stories. For instance, we've recently seen the reappearance of Primus, the "mutate" created by the mad bio-geneticist known as Arnim Zola who forsakes his former master and allies himself with Baron Zemo to destroy Captain America in a story by J.M. DeMatteis. With Zemo taking center stage in that plot, Primus is a secondary character in DeMatteis's story, but an important one since he uses his malleable abilities to impersonate Steve Rogers--and it's interesting to see how DeMatteis adapts several of Kirby's ideas for the character to build on Primus's development. Doughboy is a creature that Zola took great pride in, a servile creation that was able to take any shape or form and gave Zola both mobility and an incredible tool/weapon that facilitated his operations. If you're wondering about specifics, Zola is only too happy to demonstrate. 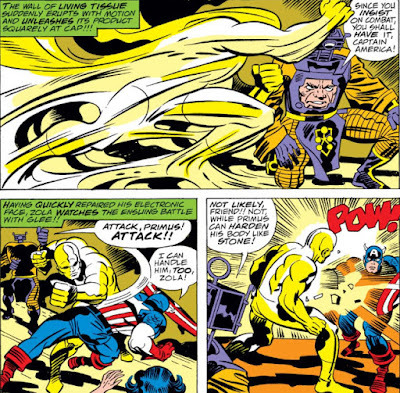 Primus enters the picture when Captain America attacks Zola and comes close to disabling him. But Zola's control module is still at hand, and Zola uses it to create another weapon from the form of Doughboy that is more suitable to hand-to-hand combat--an almost invincible form that seemingly cannot be harmed. 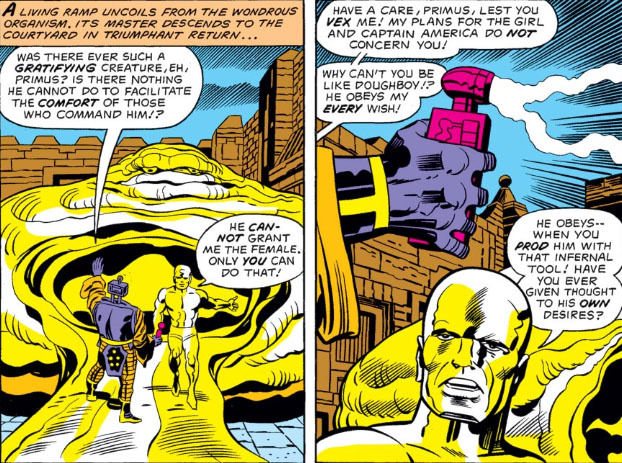 With an odd mixture of arrogance and independence that almost disavows any ties to either Doughboy or Zola, Primus is unlike the larger form he springs from, with Kirby seemingly using the character's shape and appearance of a man to distinguish him from his misshapen host in both mind as well as body--though there's really no question of his loyalty to Zola or that he'll do what's required of him, at least for the time being. 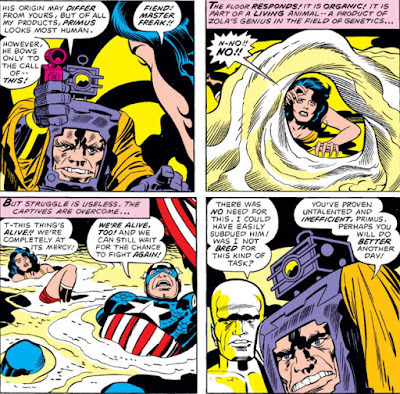 But as he follows his orders to subdue Captain America, he also focuses his attention on Donna Maria, the woman who fell in with Cap following his encounter with the dictator known as the Swine--and when Zola decides to regain control of the situation, he decides that it's Doughboy he must use to restore order. From that point on, Primus's questions and comments begin to border on, of all things, insubordination. 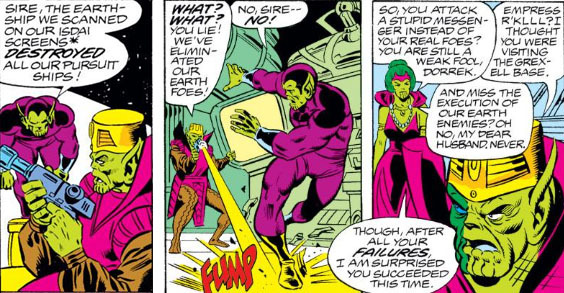 Zola, of course, has only tolerated this behavior from Primus, not condoned it; after all, Primus to Zola is a mutate that can be dispatched with the press of a button and recalled at will. Yet it becomes clear that Primus will only become more bold with his questions and, soon, with his demands--and when that moment indeed arrives, Zola returns Primus against... his will? ...to the form and substance of the creature he sprang from. And so pleased is Zola with the behavior and compliance of his other creation that he doesn't give the matter a second thought. 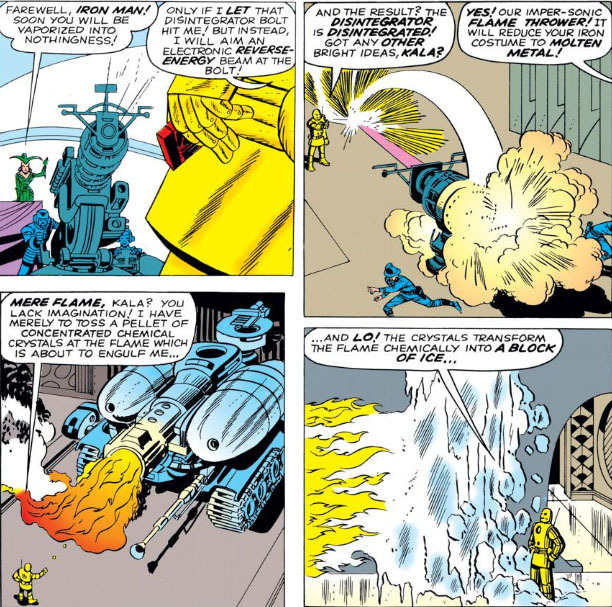 Later, when Zola's plans come crashing down around him along with his bio-engineered castle, Primus imposes his will on Doughboy's and takes control of the creature to escape the carnage, soon crossing paths with Zemo and finding acceptance instead of Zola's disdain. DeMatteis likely drafted Primus for his story because of his ability to convincingly take the form of Steve Rogers and fulfill that part of Zemo's plan, yet he makes use of the building blocks that Kirby has provided for developing the character further. 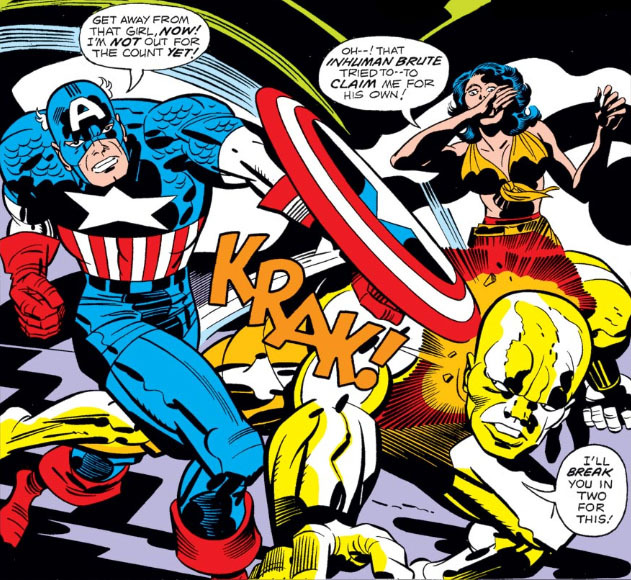 Primus remains a determined foe against Cap, but his exposure to Cap's girlfriend, Bernadette, has taught him to be less forceful in his behavior toward a woman (though there's still room for improvement). 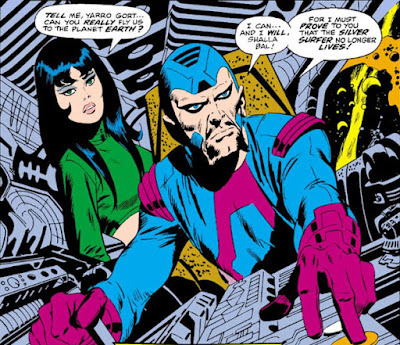 In addition, he joins with Zemo to further Zola's work with mutates, this time joining them with human hosts as hybrids in a misguided plan to use them as a stepping stone to unite humanity--unfortunately willing to use any means toward that end, even if it led to murder. Primus, it seems, remains a character who prefers to take shortcuts on his path to self-awareness. Kirby's introduction of Doughboy, part of an impressive double-page spread. 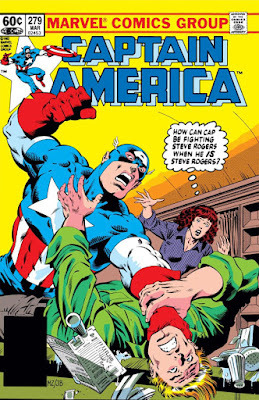 Just who is the guy in the Cap uniform handing Steve Rogers his head? Well, we're reasonably sure it's not the Captain America of the 1950s--and since they appear to be indoors, it probably isn't the giant Ameridroid. One of them could be the master of disguise, the Chameleon--probably as Rogers, since the Chameleon isn't much of a brawler and isn't likely to be throttling the guy who's Captain America. This story occurs during the distinguished DeMatteis/Zeck/Beatty run on Captain America, ending a five-issue arc where the son of the notorious Baron Zemo has taken on his father's identity and legacy and concocted a plan to destroy Cap by uprooting the foundations of his personal life as Steve Rogers and hurting the people important to him. 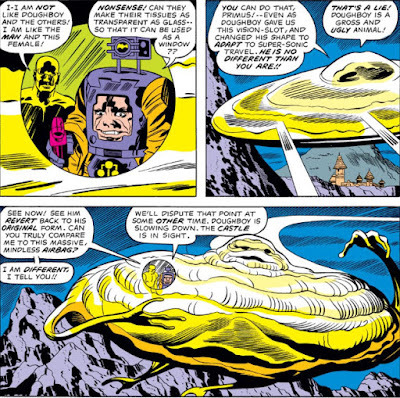 Zemo would try a similar tactic when he gathers the Masters of Evil and invades Avengers Mansion, but that's still three years off (our time); in this story, his cohorts are the creature known as Vermin, as well as a creation of Arnim Zola known as Primus, who feels a strong sense of loyalty toward Zemo in light of Zemo's far kinder treatment of him than the controlling Zola. Cap has already met Zemo on his home ground and put an end to his plan, though at the cost of an innocent life--while Zemo himself met his fate at the claws of the vengeful Vermin (though we know better). 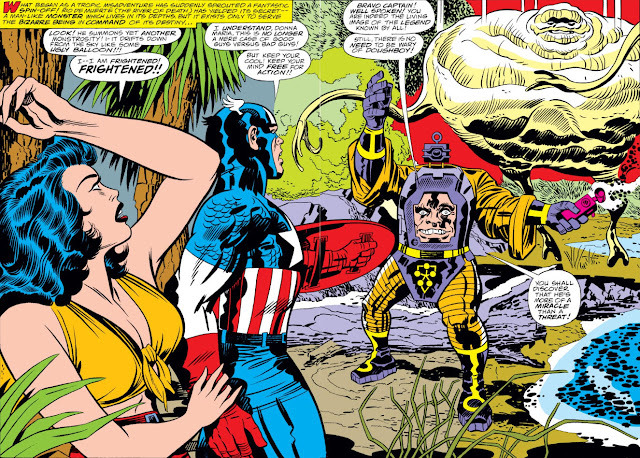 That leaves the mutate known as Primus to deal with, who has taken the form of Steve Rogers and has been growing closer to Bernadette as part of Zemo's plan. And with a S.H.I.E.L.D. 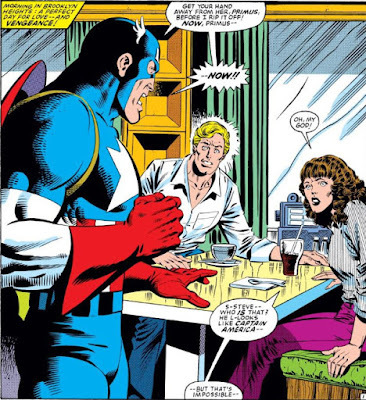 task force mopping up things at Zemo's lair, a fighting-mad Cap arrives at a Brooklyn diner to find that Primus, like Zemo, has pushed him to his limit. Good grief--a fight to the finish between Heimdall, guardian of Bifrost, and the mighty Thor! But how? Why? And by the way, don't blink or you'll miss it! 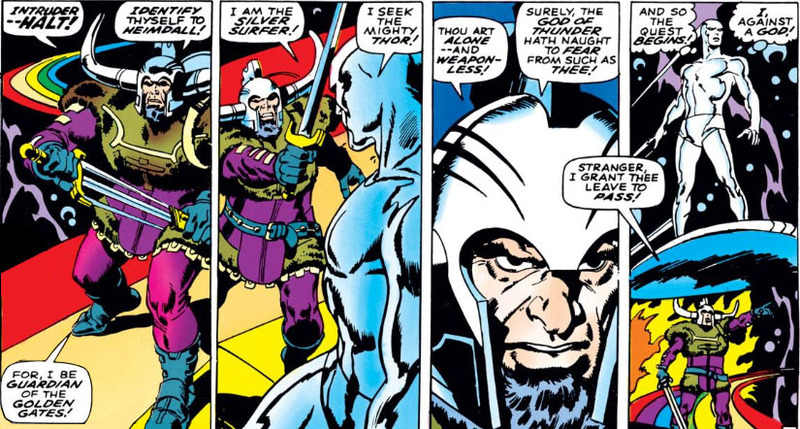 Since this is Heimdall we're talking about, a god of Asgard who's rooted to one post all day, every day, he can usually only get into a fight one way--when someone seeks to gain entry to Asgard without his consent. But Thor is the son of Asgard's ruler, a god who's crossed Bifrost back and forth for hundreds of years and seen Heimdall so often that Thor probably tips him on his way in. "Here you go, pal--that Blu-ray of Spartacus you wanted!" 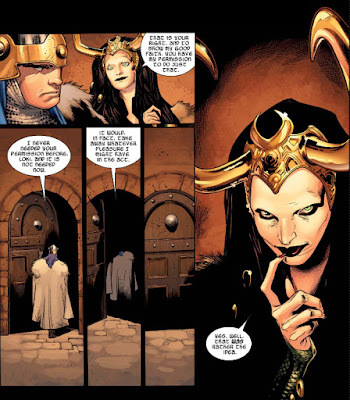 We don't know what Heimdall would do with money or cigars or contraband that gods on the way into Asgard might toss his way; he's probably hoping that someone will instead give him food or something to drink. 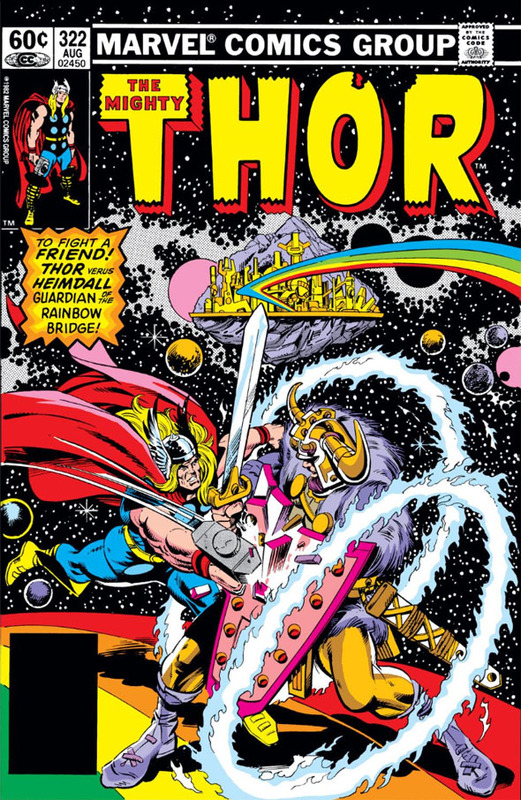 So what transgression could Thor have made to have Heimdall drawing his sword? Thor has obviously grown impatient with his charges, and protocol be hanged. But jeez, these two are going to "fight till the stars fall from the skies," if Heimdall has anything to say about it! Since Heimdall and Thor are immortals, they might actually be clashing for that long; of course, the queue of warriors trying to get past them either into or out of Asgard is going to be backed up awhile. "Look," one will cry, "I think I see a few stars falling! Get back on your steeds, this thing may be wrapping up!" And there was the time another mortal sought to gain entry--a much more powerful individual, but still mortal. 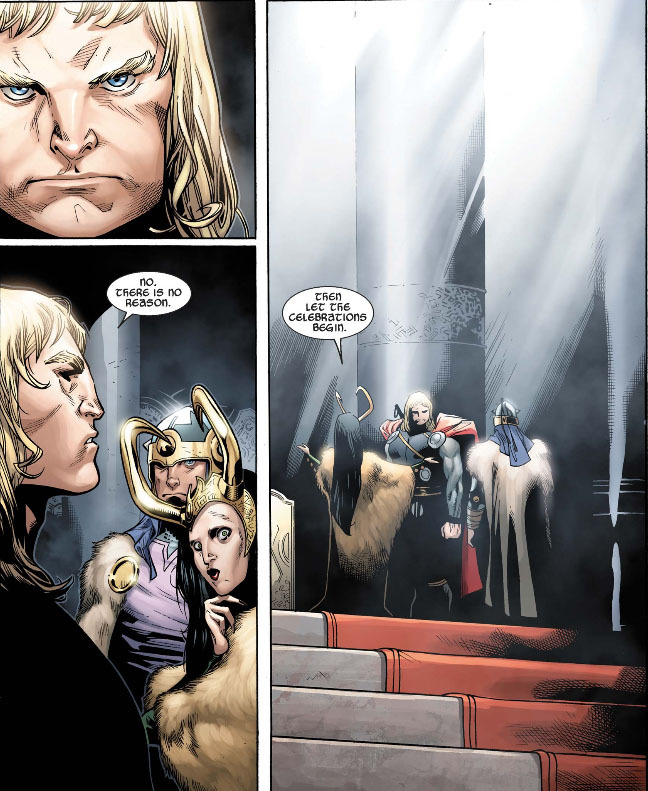 We don't know quite what it is about mortals that makes the Asgardians so perturbed about their entry into Asgard. Mortals, after all, used to worship the Asgardians and thus helped to secure their place into the pantheon of gods--yet now the Asgardians seem to treat them with complete disdain. Talk about biting the hand that feeds you! 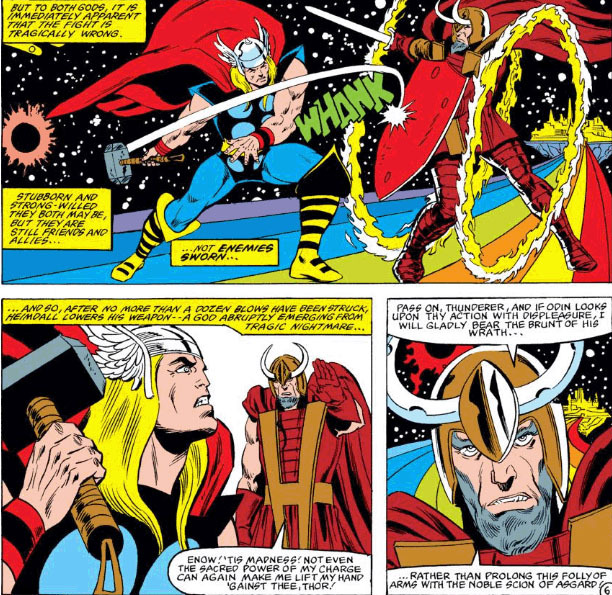 Still, there's apparently no use in pointing out to Heimdall the times he's bent his little rule of barring mortals from getting the nod to proceed into Asgard, because this time he means it, brother. And since Thor basically throws the first punch, the battle is on! It looks like Thor has gained quite the reputation for nobility in Heimdall's eyes over the years for the guardian to fold so quickly. Regardless, those of us who took this issue's cover seriously are crying out, "Jip! Jip! 60¢ for this?" 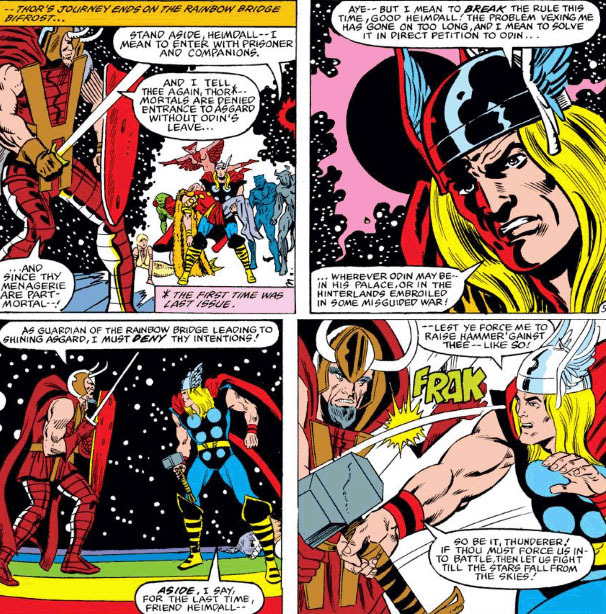 Since the rest of this issue doesn't really make up the change, we'll have to substitute another confrontation that had Heimdall going the distance, or at least trying to--for all the good it did him. He might want to reconsider his opinion on mortals, considering that one of them put him flat on his backside and demonstrated that even gods have something to learn about might. Y'know, Heimdall, for a guardian, you seem to have the words "I yield!" down pat! 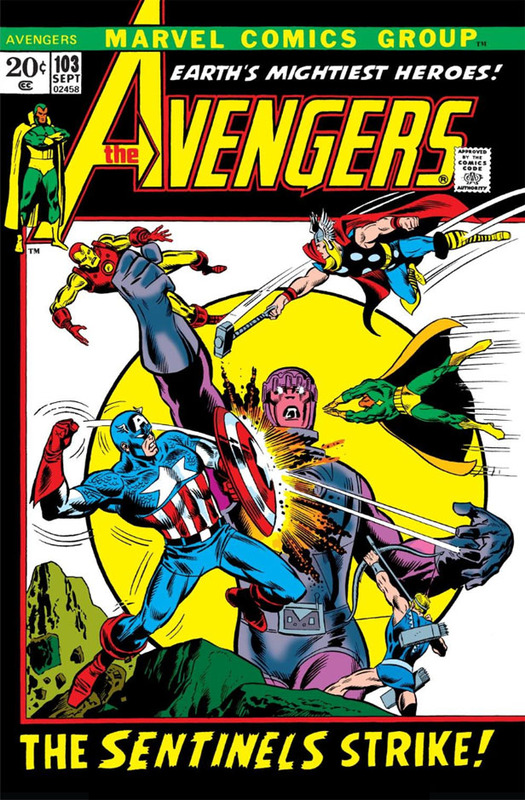 In Part 1 of Roy Thomas's story that would have him bidding farewell to his long run on The Avengers, the assemblers were racing to the Australian base of the deadly Sentinels--from two different directions. Frustrated at his comrades' inability to prevent his sister's abduction by one of the robotic giants, Quicksilver has broken off from the main group and pursued leads to the Sentinels' location on his own--taking in tow Larry Trask, the son of their creator, whose mutant power of precognition has disturbingly revealed not only the deaths of the Avengers, but the destruction of the entire planet by solar flares that have been induced through use of a beam aimed at the sun by the Sentinels. As for the other Avengers, they received warning of the danger posed by the flares thanks to information obtained from Peter Corbeau, the creator of the sun-monitoring satellite Starcore One, and, tracing the beam's origin, have now arrived in Australia to find themselves locked in battle with the Sentinels. 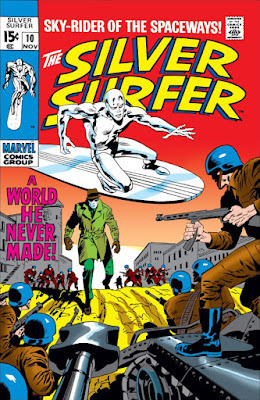 And so Quicksilver and the other Avengers have converged on Australia by way of separate sources of information. 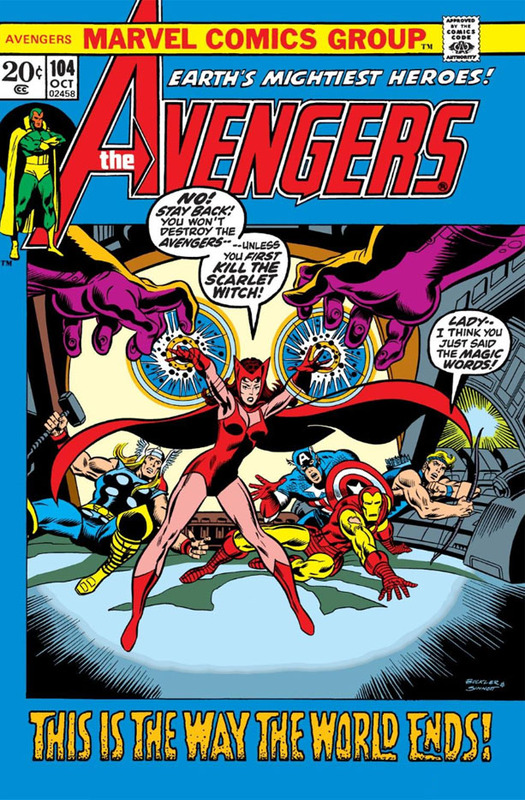 But what is the connection between the Sentinels' plans and the Scarlet Witch, the Avenger whose capture has set this story in motion? 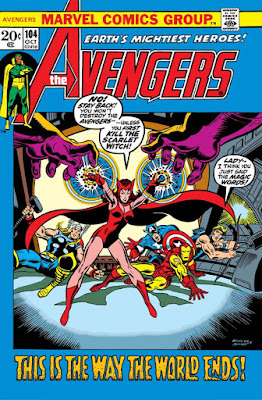 Right now the concern of the Avengers who assault the Sentinel base is to find the device that's causing the flare activity and put it out of commission--but as for Quicksilver, who has only just landed on the continent and has become aware of the flares through Trask's vision, his primary concern remains in locating his sister, Wanda. 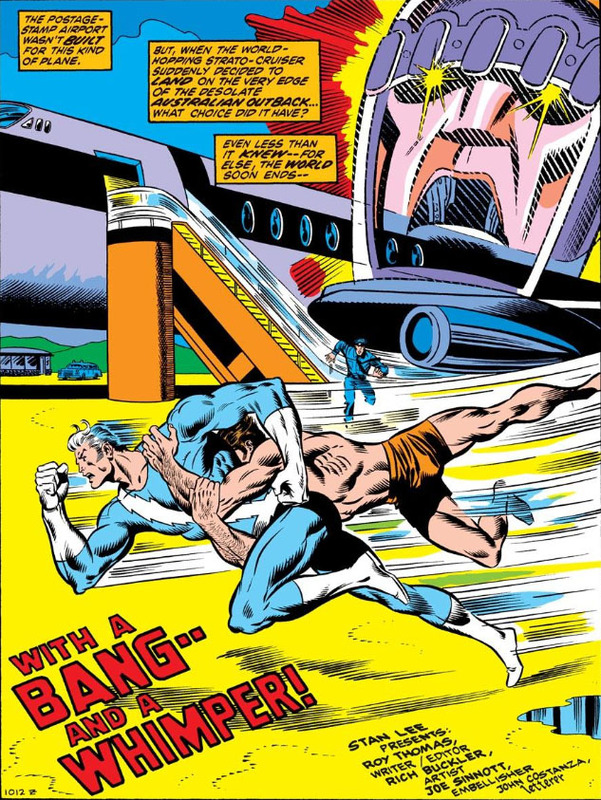 To that end, Trask finds himself along for the ride, held in the wake of a desperate Avenger who must run like the wind! From The Heart Of The Sun Strike... The Sentinels! The Sentinels have of course gone on to become very popular in comics stories, particularly given their role in the very well received "Days Of Future Past" saga that began in Uncanny X-Men and continued in one form or another in other stories as well as in feature films. These robotic beings have a curious mandate, their operations dictated by programming to safeguard the human race by capturing mutants--yet often acting autonomously when the need arises and following their own sense of logic in carrying out that directive, which usually ends up endangering the very people whose safety they strive to preserve. They thus make excellent antagonists, both for their unpredictability and their tendency to implement their programming in ways that prove deadly to even the innocent. Knuckle Under Before Kala--Queen Of The Netherworld! 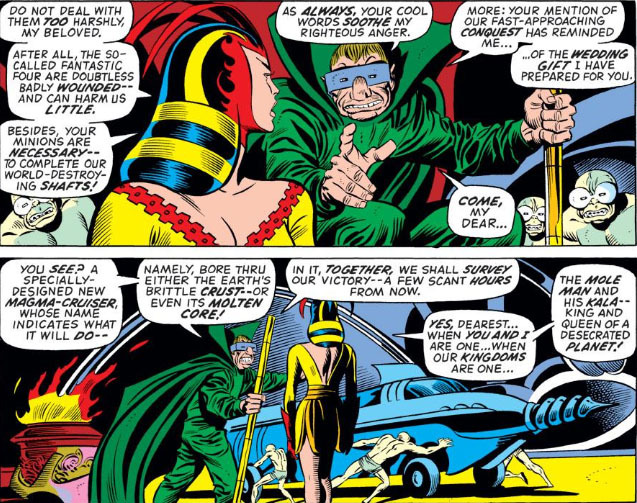 Since we've already taken a glimpse at the beauteous Kala, Queen of the Netherworld, during the time when she was the Mole Man's betrothed, let's step back a few years and see how she got her start in Marvel stories. 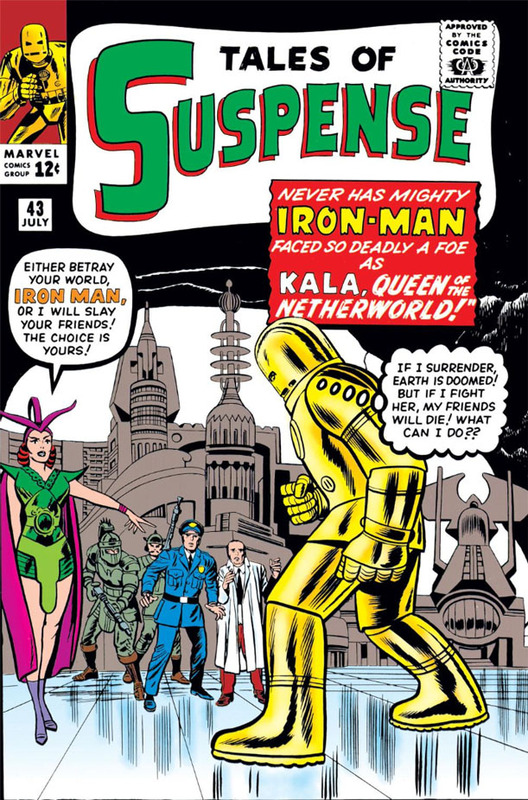 As it turns out, she came onto the scene just as Iron Man was being introduced to readers in 1963--and Kala was already looking to be a formidable foe, presenting the golden Avenger with an ultimatum that had him facing a no-win situation. 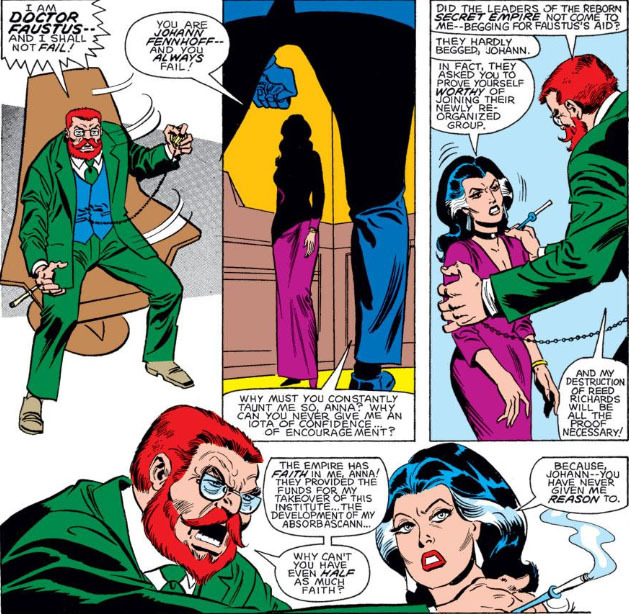 In the story, however, it's Tony Stark who first finds himself facing Kala and her non-negotiable terms. 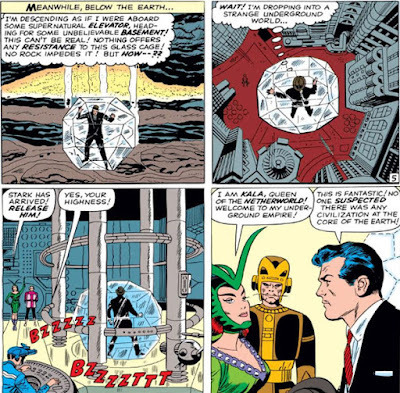 Kidnapped from his company along with two employees (no, not these two, since their first appearance in the mag didn't occur until a few issues later), Stark is taken to the depths of the Earth by a device that allowed him to pass through miles of rock as though they didn't exist. And upon his arrival, the audacious Kala--Queen of an advanced underground civilization--is there to meet him. 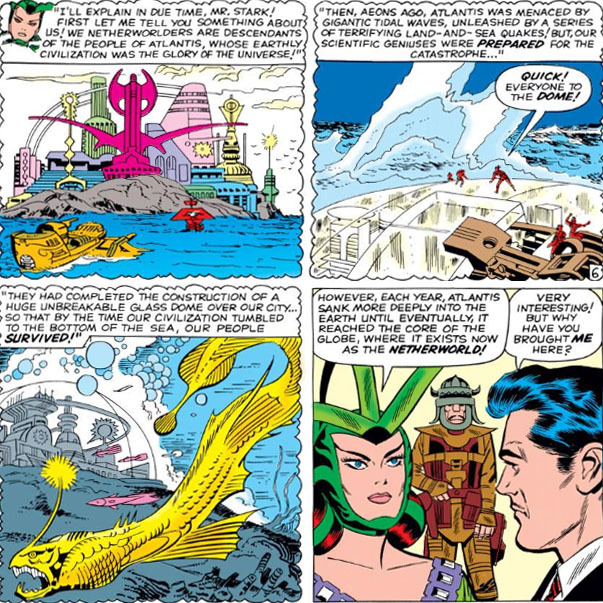 Even in these depths, Stark's reputation as a brilliant engineer precedes him, as it's his inventive skills that are needed by Kala to launch a bold invasion of the surface world. But how did this civilization become established so far beneath the Earth, and at such an advanced level of development? It seems the "Netherworld" is quite old, as, once, it too existed on Earth's surface--though it went by a name out of legend. It would make a fair post of its own to account for all of those characters who claim ties (direct or otherwise) to the lost civilization of Atlantis, but we can officially count the Netherworld and its direct descendants as one of them. Its origin given here is as plausible as any, since the consensus among most of the versions of Atlantis we read about has its inhabitants being an advanced race that is prepared to survive the cataclysm that comes. With the formalities out of the way, Kala is blunt as to why Stark has been brought to her domain, and what is expected of him. 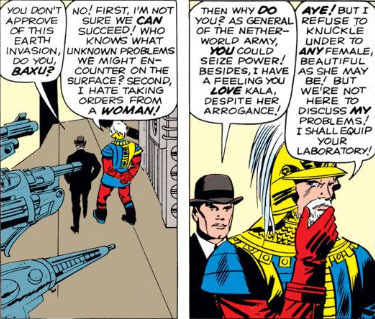 It's a bit of a leap in logic to accept Kala's reasoning here, since we have to believe the descendants of Atlantis, after all this time, would possess knowledge and resources that surpass anything that a puny surfacem... er, Stark could bring to the table. The real kicker is that they need Stark primarily to transport their weaponry to the surface, even though they obviously have technology that can move objects between their world and the surface with ease. 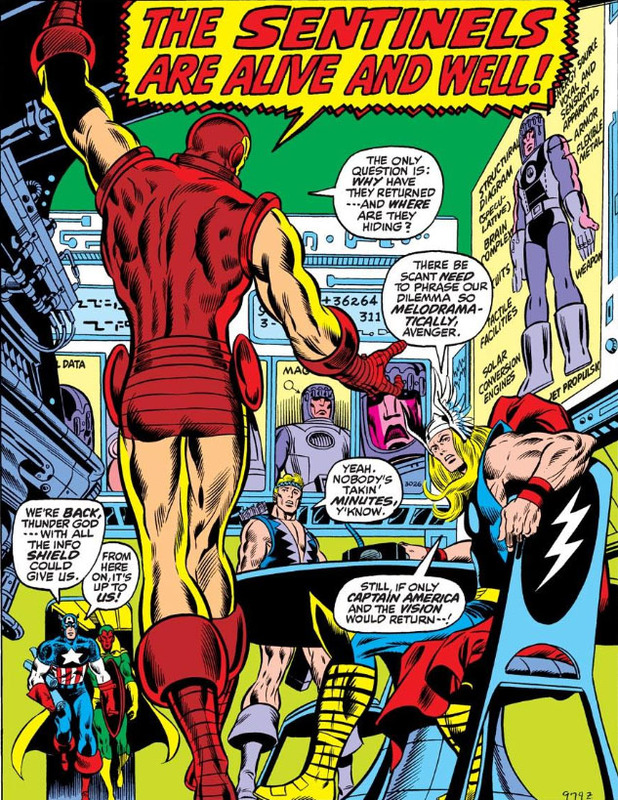 At any rate, Stark isn't about to just accede to Kala's terms, without pointing out the trump card that he alone holds in the power of Iron Man. In hindsight, this older version of the more sophisticated models of the Iron Man armor that Stark would later create appears to be incredibly powerful and not nearly as limited by comparison as more contemporary stories would have us believe; either that, or Stark is embellishing the capabilities of this vintage suit of armor in order to dissuade Kala from pursuing her plans. But as we'll see further on, Stark's clunky armor will prove to be quite a surprise to Kala. Here and now, though, Kala doubles down on her ultimatum, and throws in some additional motivation for Stark to cooperate. And so Stark decides to capitulate and submit to Kala's wishes, to the shock of those who were brought from the surface as hostages. Stark hopefully has a plan up his sleeve; but in the meantime, he senses conflict within Baxu, Kala's top general, and takes the opportunity to gain a little information off the record, information that he can hopefully make use of when the time is right. As for his plan, Stark has insisted on a workspace as well as certain materials to fulfill his part of the bargain, along with total privacy to do his work, terms that Kala accepts with delight. 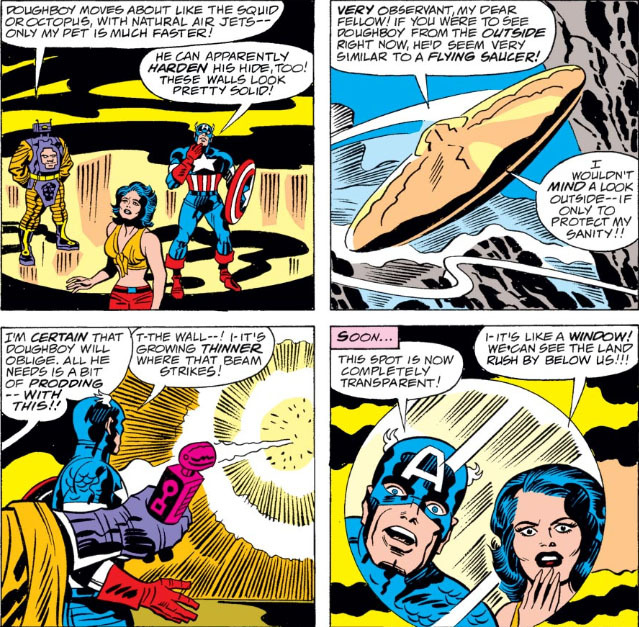 Unknowingly, she gives Stark exactly what he needs to bring Iron Man into their midst. To bring this conflict to a quick end (as if he wasn't on his way to doing that already), Iron Man grabs Kala and heads for the surface--effortlessly (yes, effortlessly) drilling through the Netherworld's super-strong dome and what must be miles and miles of strata with no problem for this armor whatsoever. There, Kala discovers why she and her race can never proceed with their plans against the surface world. 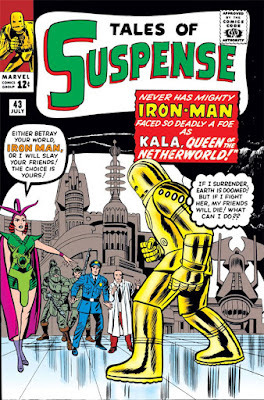 Needless to say, Kala is all too willing to release her hostages, practically gushing with thanks to Iron Man. And with Baxu having a clear path with Kala, it seems the Queen of the Netherworld will be content to exist in her own world--now that she's assured that her youth and beauty will remain intact. She may have been willing to take on the forces of the surface world--but it looks like it was a battle with time that was the deal-breaker. From here, we know that Kala eventually wound up in Subterranea with the Mole Man--but what spoiled her contentment in the Netherworld? 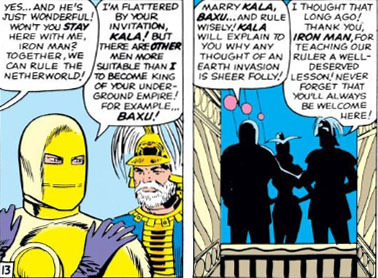 Baxu's unexpected, sudden death not long after they were married was one factor; following that, her subjects deposed her as Queen, having never forgiven her for their defeat at the hands of Iron Man. 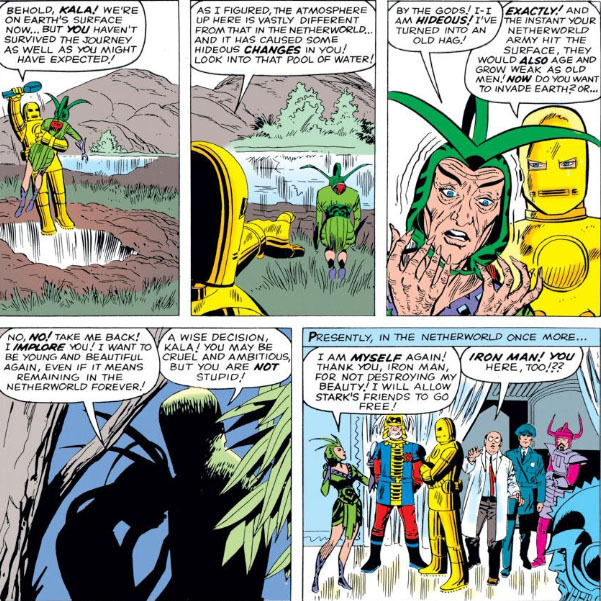 Forced to leave the youth-giving aura of her homeland, she sought out Tyrannus, since he controlled the "fountain of youth" waters which also kept his old age at bay--though she learned that the fountain had fallen under the Mole Man's control. Today we take a look at a few of the women behind the men, though that positioning is often deceptive. Like Anna here, who can humble even the manipulative Dr. Faustus with just a few well-chosen words, the ladies featured here will leave little doubt as to who is wearing the pants in these pair-ups. 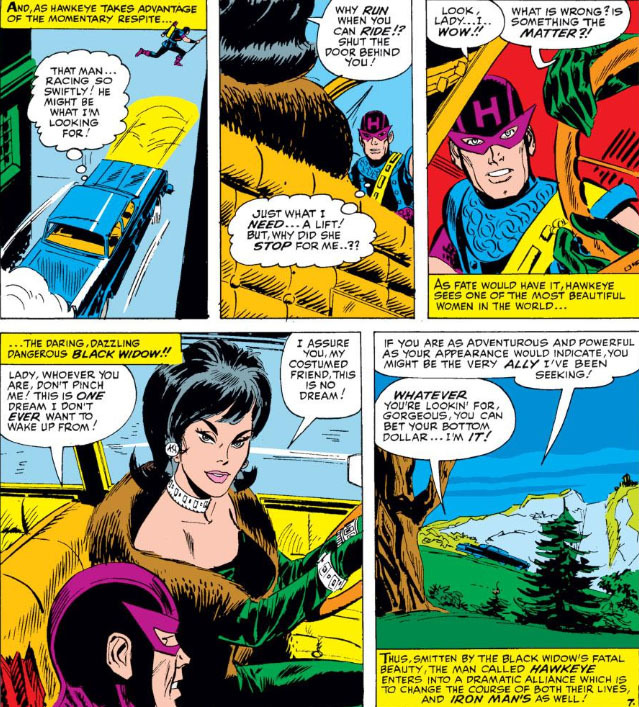 It's tempting to label some of them femme fatales and leave it at that--but perhaps it's more accurate to call a few of them outright schemers when it comes to gaining their objectives. And not many of them have complimentary things to say about the object of their disaffection. In the case of Anna, it looks like she's content with exercising a measure of control over Faustus, while taking a moment to crush his ego while she's at it. 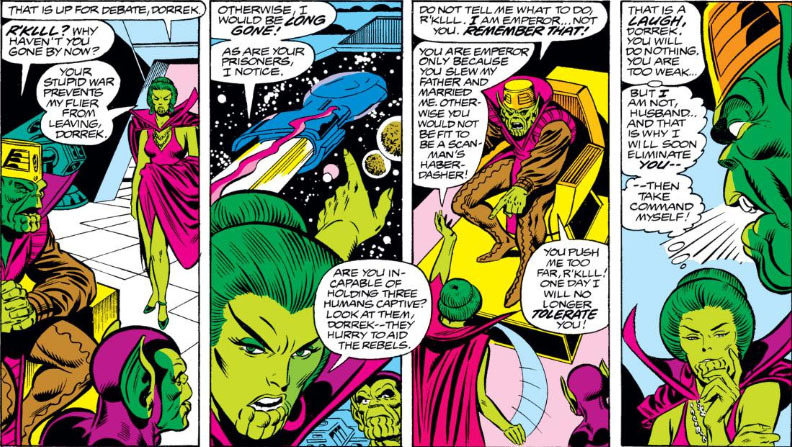 On the other side of the galaxy, there's also the lovely R'klll, who belittles her husband, the Skrull Emperor, at every opportunity. Having his shrew of a wife go on holiday is no doubt a dream come true for Dorrek--but the bane of his existence isn't quite through imposing her presence on him, particularly when she has a scheme in the works. And unfortunately for Dorrek, R'klll indeed makes good on her word--but that's another story. 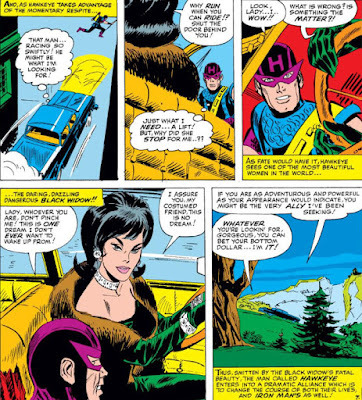 Perhaps the queen of femme fatales would be the Black Widow, who took aim at Hawkeye with marksmanship that far surpassed his own. 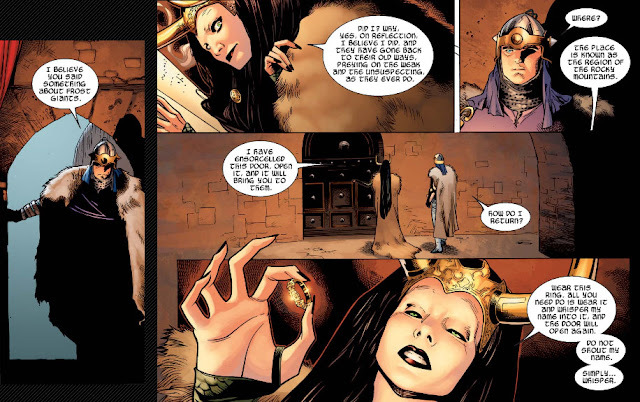 And speaking of queens, there's also Kala, so-called Queen of the Netherworld (which would be news to Pluto). 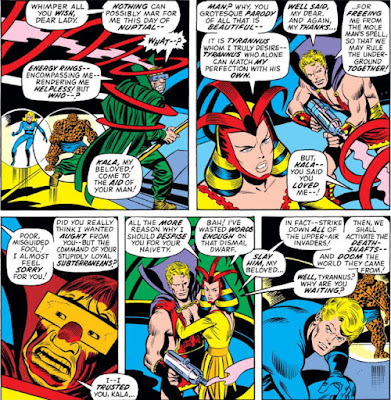 Kala would end up in the Mole Man's domain after her tussle with Iron Man--and given the Mole Man's resources, it's not hard to guess that an opportunist like Kala would choose to consolidate her power by appealing to the Mole Man's vanity, and to his very lonely heart. But unknown to the Mole Man, Kala has eyes for another--an entranced captive "guest" of the Mole Man and a ruler in his own right, finally set free by one as conceited and ambitious as himself. Yet Kala will find that the vainglorious have little room for those who seek to share their glory. Finally, there are few more adept at scheming than the Asgardian God of Mischief, Loki--but aren't we profiling the women who assume such roles? 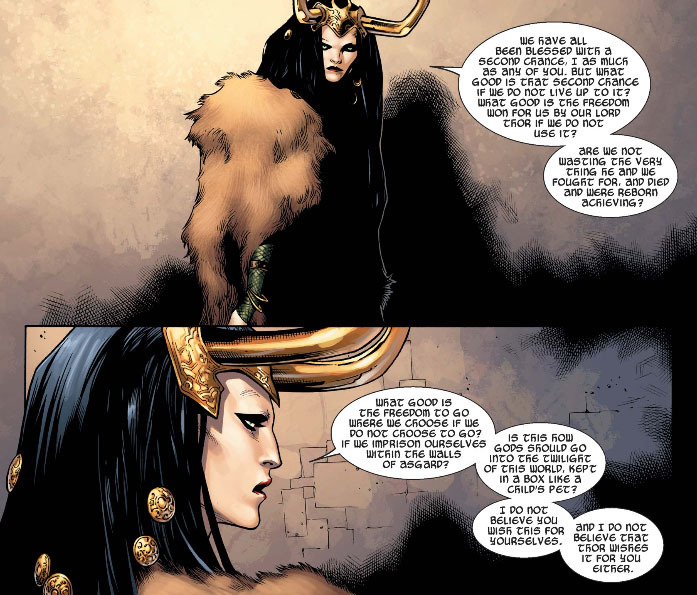 Quite so--which is why we now indeed turn to Loki, who had astonishingly returned to his immortal existence in the form of a woman following the passing of Ragnarok. 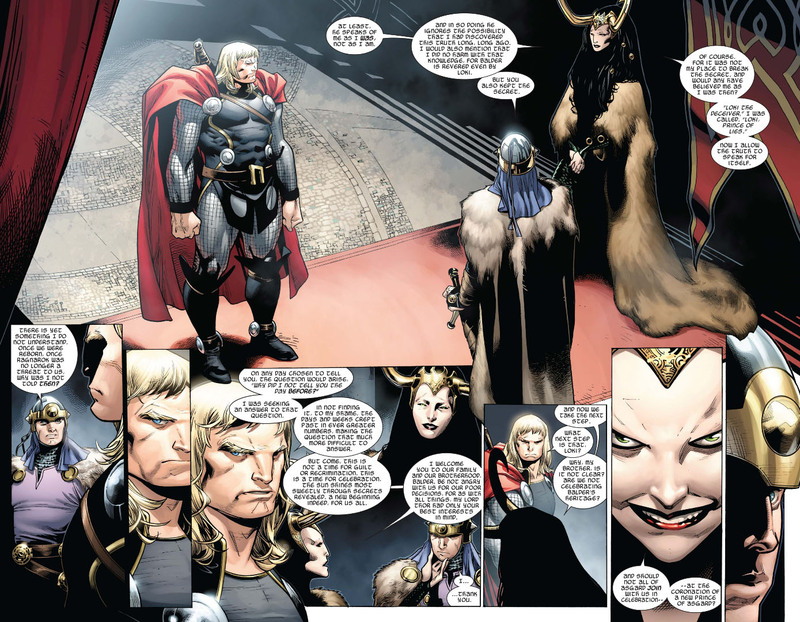 More soft-spoken and less overtly threatening, but no less wily, Loki sought to become a trusted confidante to Balder the Brave, on track to becoming ruler of all Asgard. Loki's expression here speaks volumes--in essence, he's... er, she's thoroughly enjoying moving the Asgardians about like pawns on a chess board, all in the guise of one who appears to have turned over a new leaf in his new existence. In this case, she brings Balder one step closer to the throne by divulging that Balder, like Thor, is a prince of Asgard by blood, a product of Odin's indiscretion with the goddess Frigga. 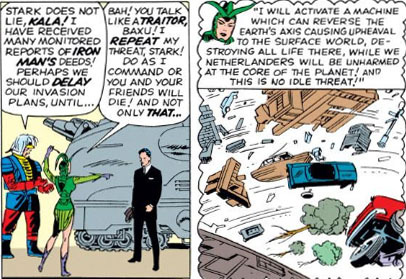 And so subtle are her machinations that even Thor cannot find cause to turn aside her counsel. It's a little difficult to tell here just who is being moved closer to power, eh? Kala, Queen of the Netherworld! The All-New, All-Different... Femme Force! The Stranger And The Sacrifice! ...And A Child Shall Kill Them! Marvel THEN and Marvel NOW! Make Way For The Demolition Man!